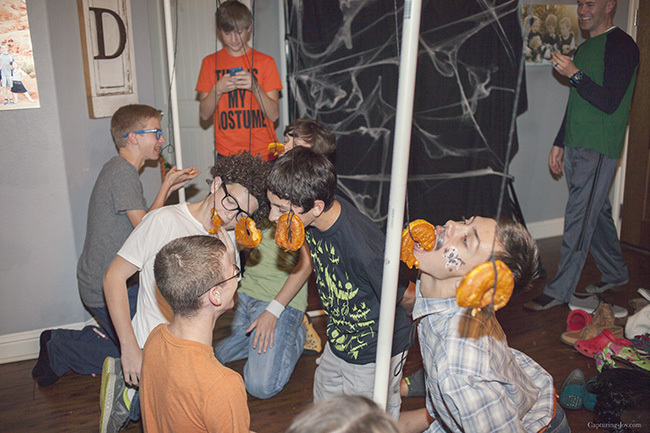 These fun Halloween party ideas are great for any age, including teenagers. 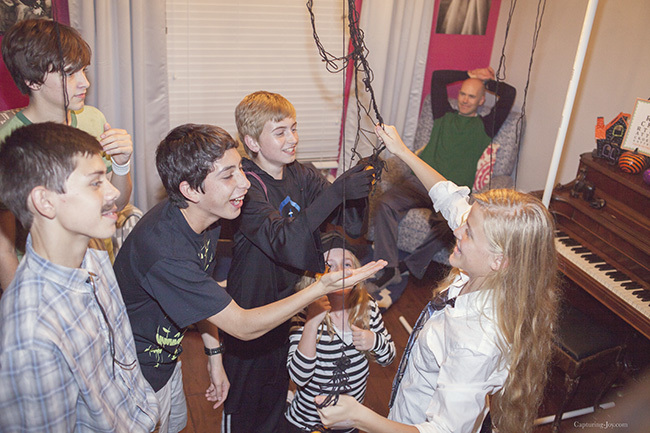 Check out the Halloween games and treats that made this Teen Halloween Party a success. 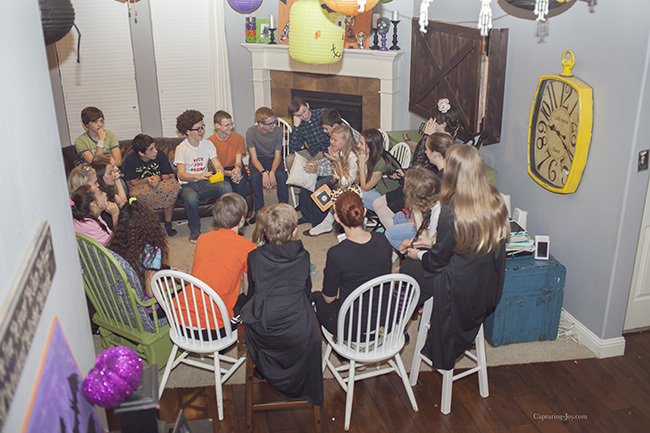 I’ve thrown a couples Halloween party for many years, but for various circumstances, last year was the first year I didn’t do it. 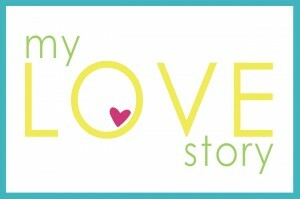 That chapter in my life closed, at least for now. 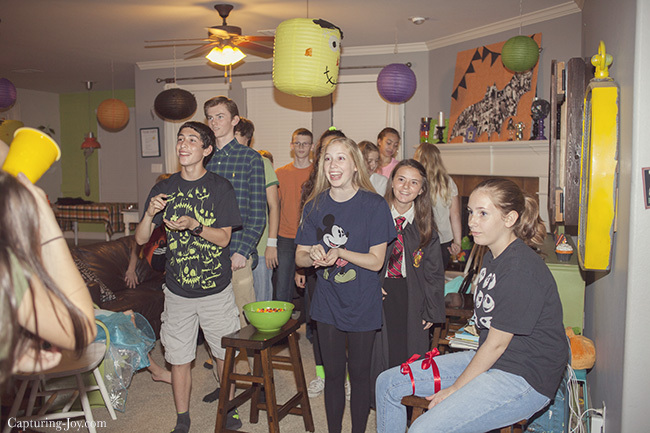 This year, I got all excited to do a halloween party with another group, my teenage seminary (bible study) class. We meet each weekday morning from 5:45 a.m. to 6:30 a.m. to study the Old Testament, and this was a fun way to socialize on a Saturday night. 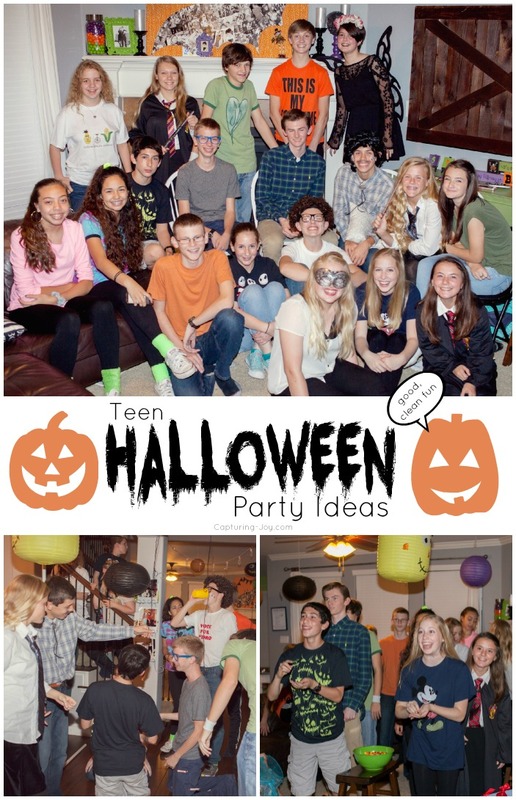 I like to do monthly weekend socials to do fun activities, and this one just centered around Halloween. My big goal with these get togethers is SOCIALIZATION, to help these kids get to know each other better, so that’s what I did with all the games and activities, too. These days with phones and texting and media distractions, encouraging socializing is SO important! Here is our group. 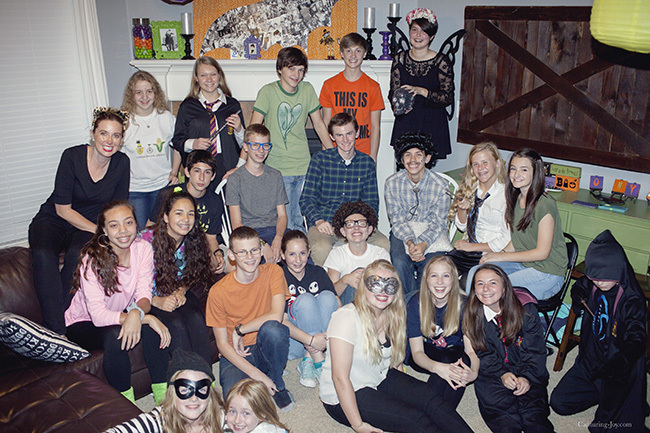 Even though I mentioned dressing up, the teens took the low key approach. 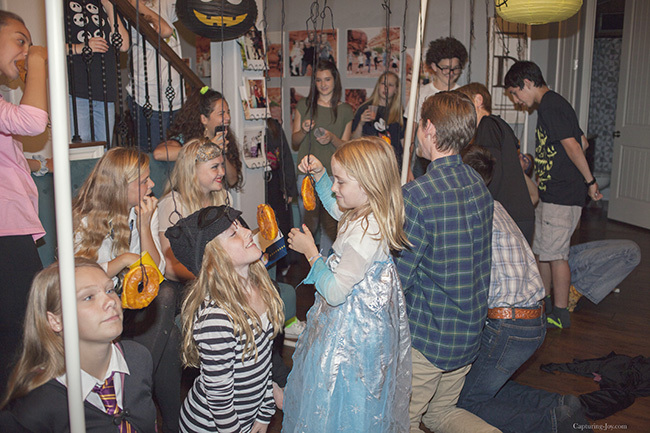 I’ve found with costumes, we go ALL out as little kids…then there comes a time when it’s “un-cool” to dress up, then as adults we get all into it again. I take the pretty low key approach myself, most of the time. I love Halloween, I but don’t get into dressing up as much. 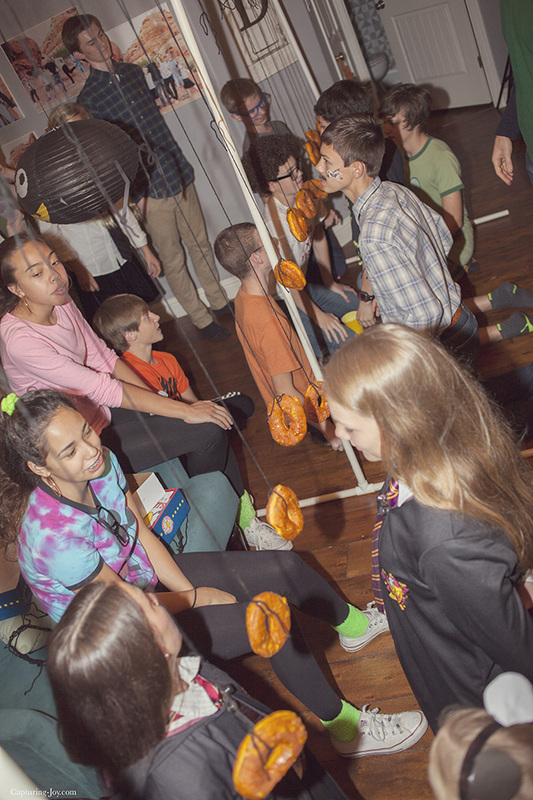 I like to wear orange and black and Halloween t-shirts, and encouraged these kids to at least try to wear orange or black or wear something “Halloween-y.” Most of them did that well! 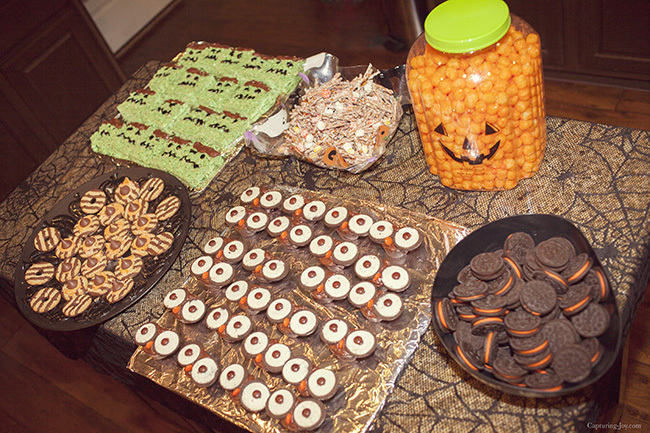 I had a handful of Halloween snacks at the ready. My friend Charlene helped me and made the owl brownie cookie treats and Frankenstein krispie treats, I did the rest. My favorite (food) part was making homemade root beer with dry ice. My mom did that as a kid, and she has me stocked up on root beer extract to make it. Note to self: Wal Mart sells dry ice, it’s hard to find! It is also hard to find extract. 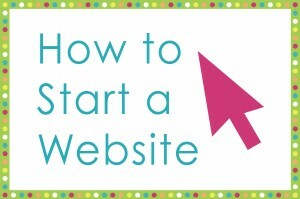 You can get it on Amazon via that link, or Wal Mart often has it. 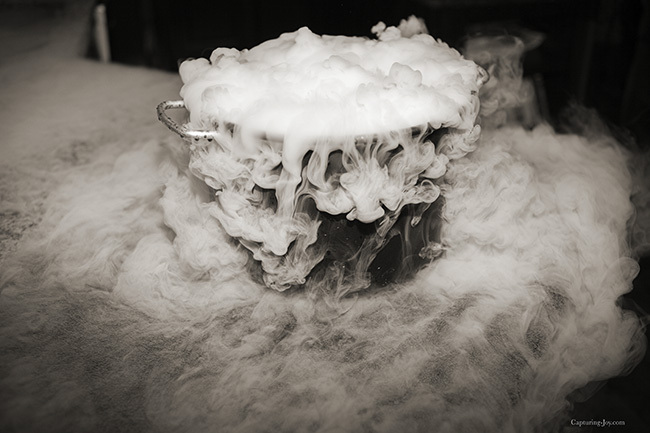 The cauldron of dry ice melting is lots of fun for Halloween. 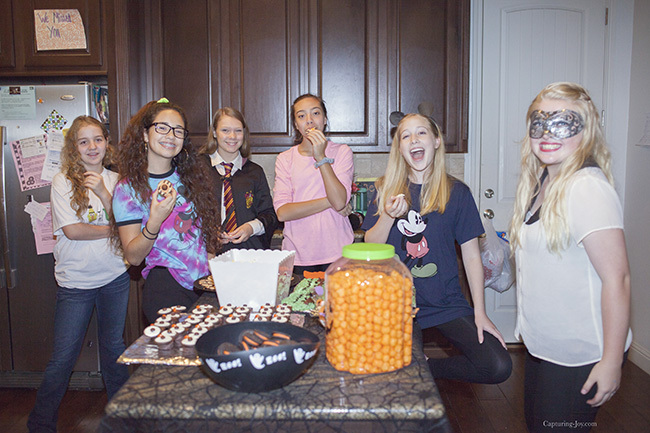 As we waited for everyone to arrive, we started with snacks. I contemplated the Halloween Trivia that I shared in the couples party, but didn’t print it in time, and the socializing was good anyway. 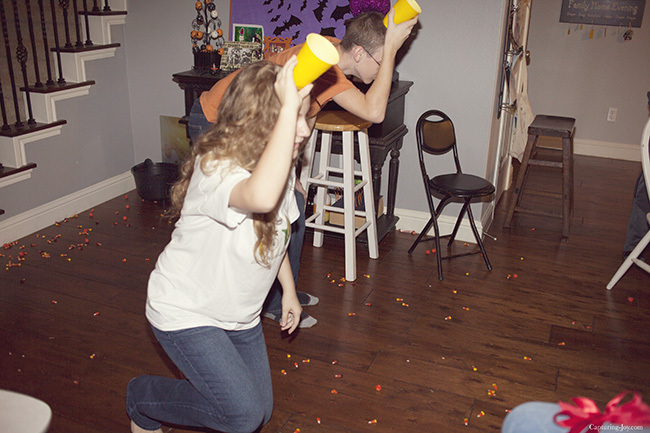 We then played the “throw candy corn in a cup” game, and that was actually more fun than I thought! 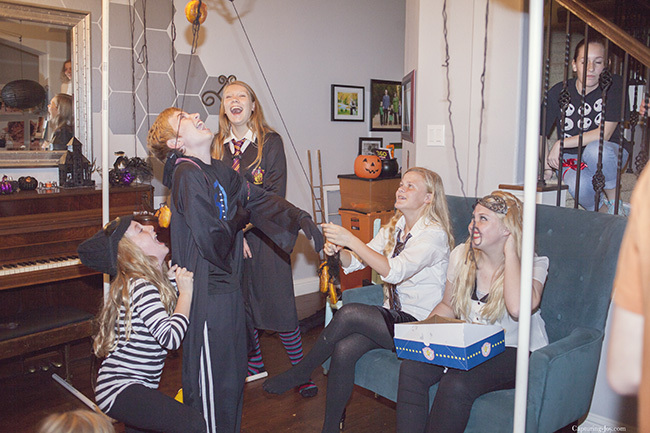 I’d read a few variations online, but what we ended up doing, was to split the group into two teams (boys vs. girls–they always love that), and give them 20 seconds each to throw candy corn into the cup of the person holding it on their head. When 20 seconds was up, the cup holder went to the back of the line and the person throwing holds the cup. 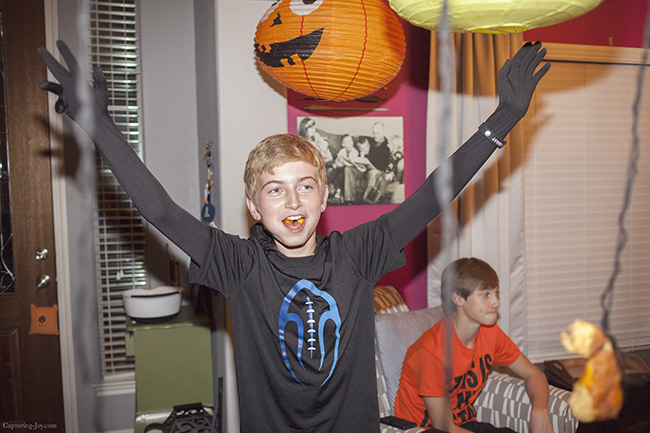 When we cycled through everyone, whoever had the most candy corn in their cup, that team won. I meant to get team prizes, but nobody seemed to care about that, which was great. Whew! My son is here in the blue glasses, he was “smarty pants” with smarties on his pants, but most had fallen off by this picture. I love this next picture of all of the candy corn strewn on the floor. Shows a good time! The kids were great at helping to pick up the mess after. Next, we had pre strung donuts, and tied them to the PVC pipes my husband set up (we’ve collected pipes over the years for optimal blanket fort building). 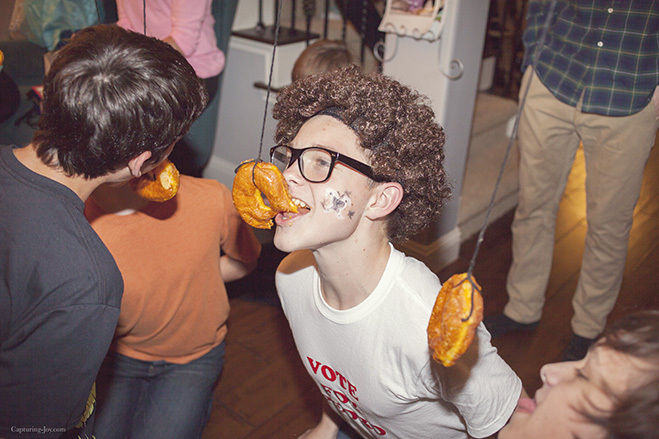 You can never go wrong with donuts on a string, we also did this with the adults. 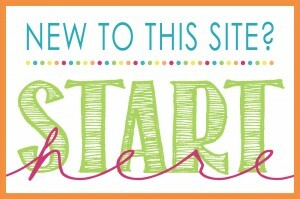 SOO fun to watch, too! My girls were loving it. 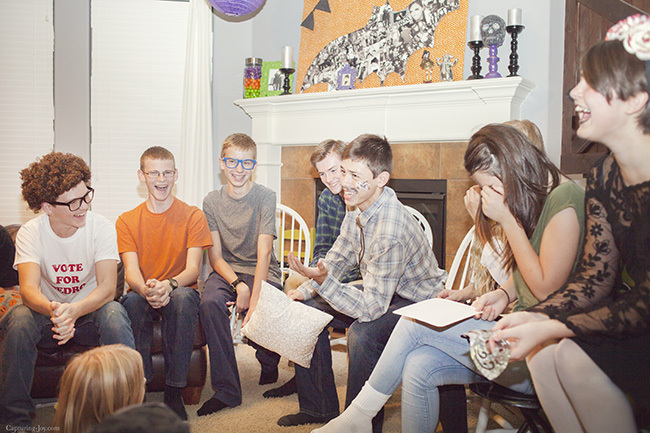 I love that my family gets to enjoy and get to know my seminary students at events like this, and vice versa. My class kids were so great about one slightly crazy 6 year Frozen character (who shall remain nameless) old pestering them, just like she was one of them…or their active little sister. That was SO much fun! Since there were so many kids, I told them they each had 30 seconds. Most went to about a minute, but the point was I didn’t want it to be 5 minutes each, and it got them in “quick speaking” mode. 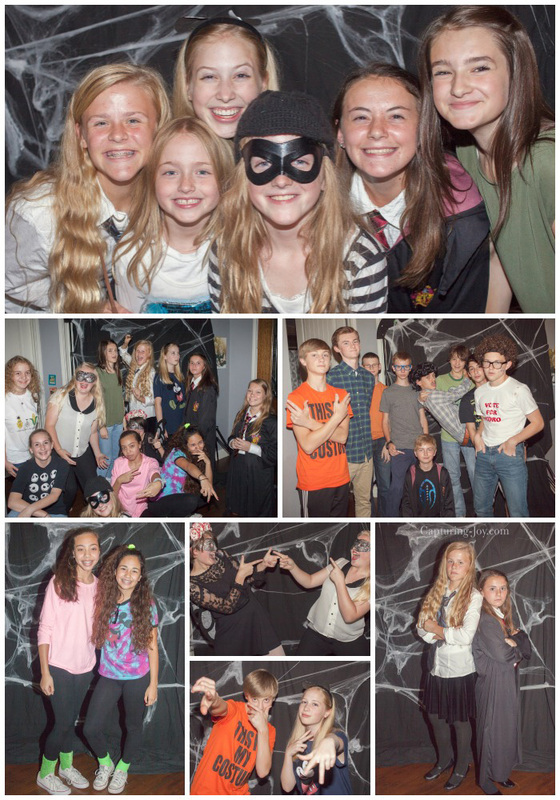 After that, we took some pictures at the cobweb photo backdrop I set up. I jumped into a group shot with the group, with my 3 younger kids also in it (my husband is a great picture snapper). 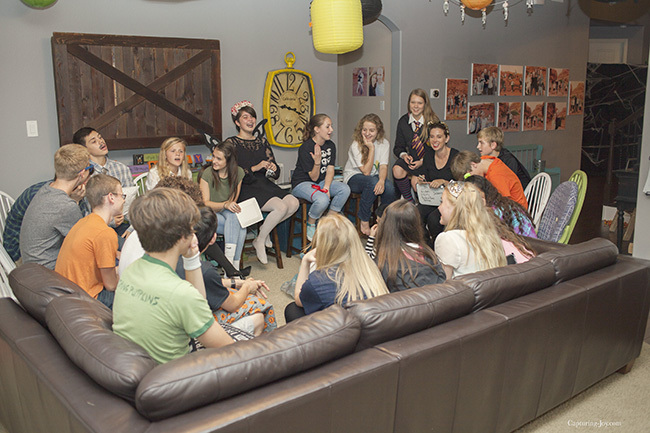 Again, I know it may be difficult to find me, since I blend in with the teens, but I’m on the left with cat ears—ha ha! I just love this group so much, and I’m grateful for the opportunity to be among them. They impress me with their goodness, and their desire to do what is right. Every day they get (REALLY EARLY) up for our bible study class, and I learn so much from them. Just a few days before, we discussed the story of Joseph in Genesis, how we was sold into slavery by his brothers, and eventually was 2nd to Pharaoh for his goodness. How he FLED from Potipher’s wife, and we had a pretty direct talk about when to FLEE a situation (and I’m all about uncomfortable specifics so there is no question). That night, one of the kids told us that she was at a school related party just before ours, and that it was LAME. When I inquired, she said the 9th/10th graders started drinking alcohol, with the parents around. She felt uncomfortable and chose to FLEE. She listened to that still small voice that told her it was not a good place to be. She said our group party was WAY more fun. I’m so pleased that she chose to FLEE, to share it with us, and that she recognized the stark difference between the two parties. 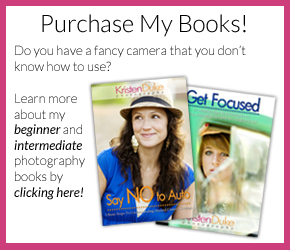 What I want for this group, and other teens out there to know, is that there ARE options. 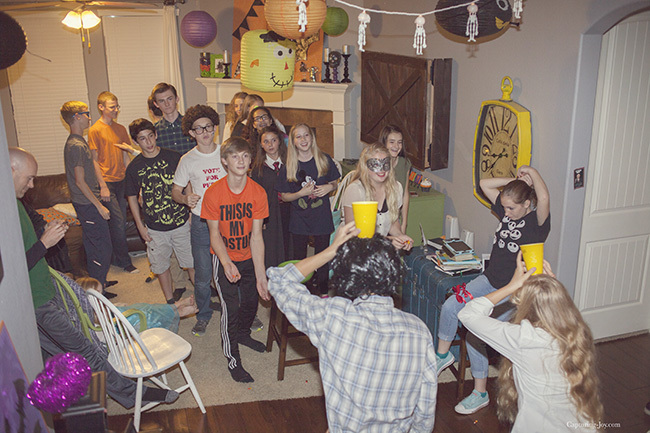 I want my class to know the stark difference between a lame party with alcohol and a good clean party with FUN! I want to provide an option for them, that at least once a month, they can get together, and have that fun, and I’m grateful our church has dances and other activities for our youth to do as well. I want them to know, my home is always open for them, and I’ve given the invitation that I’ll come rescue them if needed…anytime, anywhere. They are such good kids who are fighting the fight daily in high school. My hope for them is that they can form a bond with each other that will carry them through the next four years, because they need each other more than they know.